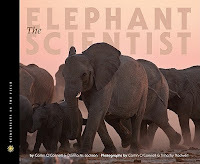 The Elephant Scientist by Caitlin O'Connell & Donna M. Jackson, photography by Caitlin O'Connell & Timothy Rodwell. Grades 4-7. Houghton Mifflin, July 2011. 70 pages. Review copy provided by publisher. With a book in the Scientists in the Field series, you know what you're getting: a well-researched, nicely laid out book about a scientist and the work that he or she is doing. That said, not all SITF books are created equal and this is one of the better ones. Caitlin O'Connell has been fascinated by animals from an early age. After studying insects in Hawaii, her research took her to Africa where she studies elephants. In particular, she studies how elephants communicate, and she's found that elephants are able to sense minute vibrations in the ground through their feet. Could this allow Caitlin to develop a harmless way to shoo elephants from farmers' fields or entice them back to their home areas in wildlife refuges? A huge strength of this book is the stunning, clear photography of elephants in the wild. From aerial photography to close-ups, from seasoned matriarchs to "teeny" babies, these photos will captivate kids. Elephants are already a popular topic and this book explains some of the current research going on with elephants. Although Caitlin studies elephants in the wild, she's also studied elephants in captivity, including one elephant who was taught to respond to vibrations in the ground in order to test her range. There is much to study about these majestic creatures, especially as humans encroach on their territory. If we're going to save elephants (Asian elephants are currently endangered and African elephants are vulnerable), we have to learn how to get along with them. Of course, since this is a Scientists in the Field book, you can trust that it includes a nice array of back matter, including an index, glossary, bibliography, and further resources. This series will inspire young minds and The Elephant Scientist is a worthy addition to the ranks (and your shelves).